Can a mentoring relationship between nations expedite implementation of the iHRIS open source software for tracking and managing health workers? With that in mind, Robert Nguni of Capacity Kenya recently traveled to neighboring Uganda for a week-long visit to learn about strategies successfully put into practice by the Uganda Capacity Program. I interviewed Nguni, senior manager of HRIS in Kenya, along with Ismail Wadembere, HRIS manager, and Norbert Mijumbi, HRIS developer, in Uganda to find out more. Kenya and Uganda have much in common, sharing similar political structures and similar challenges in putting systems in place to track health workers. The Kenya project, however, is in the early phase of iHRIS implementation while the Uganda project is wrapping up and preparing to transfer iHRIS activities to the Ministry of Health. To meet the needs of Uganda’s Ministry of Health, the Uganda Capacity Program tailored iHRIS Manage and iHRIS Qualify. The resulting software solution, dubbed the Human Resources for Health Information System (HRHIS), is implemented nearly nationwide. The Uganda Capacity Program provides technical assistance for installing and administering the HRHIS and rolling it out. Capacity Kenya works with Kenya’s Ministry of Health to customize, implement, and populate iHRIS throughout the Ministry and in the nation’s counties, as well as at faith-based organizations and national referral hospitals. Much work remains to anchor iHRIS in the nation’s information and communication technology infrastructure. The teams kicked the week off by visiting the Uganda Ministry of Health, which uses the HRHIS to manage its employed health workers. So far, the system has been rolled out to 81 of the 112 districts, which share information on nearly 60,000 health workers with the Ministry. According to Wadembere, for a health worker information system to work, the central Ministry needs to take ownership of the system. Another critical piece of information shared during the visit concerned the recruitment and development of future iHRIS specialists. 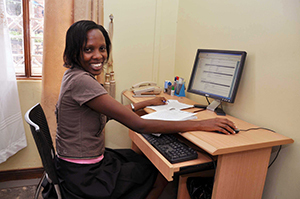 The Uganda Capacity Program works with Makerere University in Kampala, where students in the College of Computing and Information Sciences who are interested in programming can track into an HRIS development program. Graduate students complete a two-month-long practicum with the Uganda Capacity HRIS team, learning to install and customize iHRIS. Undergraduate students can place into the Uganda Capacity Program as interns for six months, where they learn the ropes of HRIS management and then deploy for two months to work with organizations in need of HRIS support. “Because of the internship program, there over now 20 technical persons who can be called upon to carry out HRIS customization, training, and rollout” in Uganda, said Wadembere. Uganda’s four health professional councils are using iHRIS to ensure health workers’ qualifications are up to date. The councils have all made their data freely available to the public by posting it on the Ministry’s website. The Medical and Dental Practitioners Council has even gone a step further and created a mobile directory, which allows anyone to use text features on their phone to find out if a health clinic or health worker is properly qualified. Nguni and his colleagues have already presented this information to the Kenya Ministry of Health and will be conducting a preliminary meeting with the Nursing Council of Kenya to discuss sharing its data with the public. It wasn’t just the Kenyan team that benefitted from the experience. Developers in Uganda also picked up a thing or two. Uganda is in the process of centrally hosting its iHRIS so that district governments can access the central database. Kenya has already established such a system, and the Kenya team was able to share its strategies with the Ugandans. The Kenyan system also automatically sends reports to users, and the Uganda developers showed a lot of interest in adopting that as well. The Kenya-Uganda connection serves as a mentoring model for other nations as they plan to implement iHRIS. The Uganda Capacity Program and Capacity Kenya are funded by USAID and implemented byIntraHealth International. CapacityPlus, IntraHealth’s global project that is also funded by USAID, develops the core iHRIS software and releases updates.